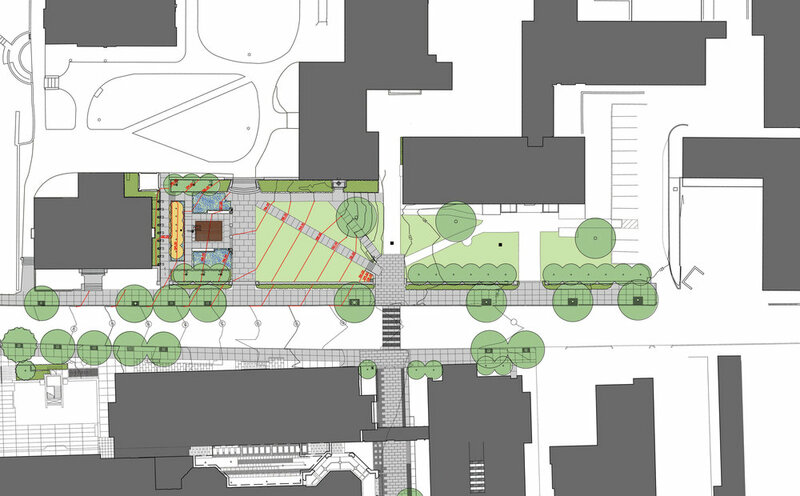 We were asked to redesign the green space at the front of the Pembroke Campus to create an appropriate terminus to the Brown Walk. This front green receives the long axis of the Central Walk and redirects it to the main axis of the Pembroke Green to the west. A new gate provides a culmination to the Walk and marks the threshold into the Pembroke Campus. The tree canopy opens up toward the west and is more constricted to the east to encourage a western reorientation upon arrival. A tribute garden complete with a monument to the alumni of the former Pembroke Women’s College is sited at the western end of the space to provide a further indication of the western shifting movement. An existing stone wall along the street frontage is lowered to provide a more inviting transition. The site is also carefully regraded to enable handicapped access to the upper Pembroke Green that did not previously exist.